Easy to use Broadcasting system, Broadcast with all your Family and friends ! 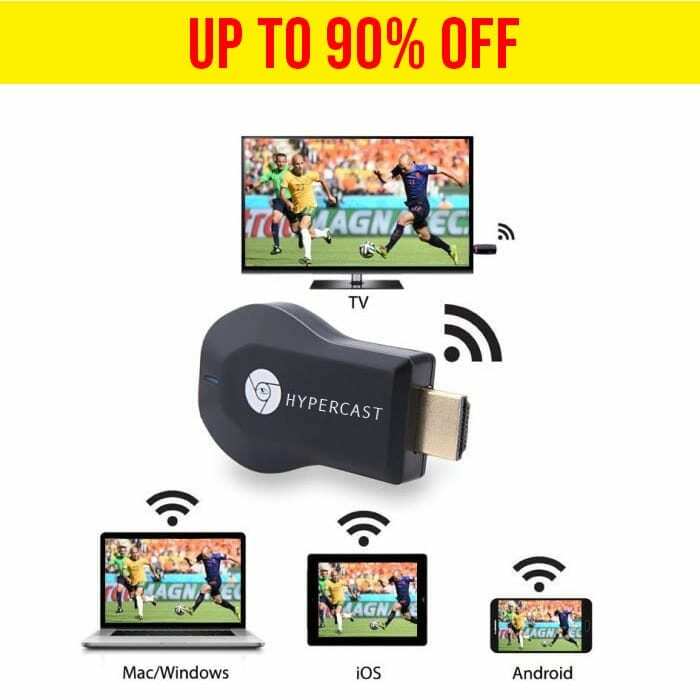 This Wifiless display Dongle will mirror what is displayed on your device screen- including 1080p videos, games, audio, pictures, apps and more – to your HDMI-equipped TV, display, projector or other compatible display in up to 1080p HD. Support HDMI 1.4; A 1080P full HD output provides the perfect experience. It is compatible with smartphones and tablets such as iPhone, Samsung, Sony, iPad with Android 4.2 and iOS 7 above, Windows8+/Mac10.8 laptop, eg iPhone8,8 Plus, 7/7 Plus, 6/6 Plus, 6s/6s Plus, 5/5C/5s , 4S/4, SE, iPad 2/3/4/iPad mini/Air/Pro, Samsung/Google/Nokia/HTC/LG, etc. Only 3 steps necessary to enjoy your media files on the large screen. Plug>Connecting>Mirroring by using Miracast, Airplay is for iOS/Mac, and Miracast is for Android/Windows. The Wifiless display Dongle meets stringent CE & ROSH certification requirements for product safety, which drastically reduces the risk of overheating and disconnection compared to other HDMI dongle. Note: Please check whether your Android smart device supports MiraCast(if not, it will not works). For this product we provides a 30 days money back guarantee with a 1-year limited warranty. Any problem met on you pls contact us at anytime and our service always be there (contact us for more information).